"Chester Atkins" redirects here. For the former U.S. congressman, see Chester G. Atkins. "Mr. Guitar" redirects here. For the album by Charlie Byrd, see Mr. Guitar (album). Chester Burton Atkins (June 20, 1924 – June 30, 2001), known as "Mr. Guitar" and "The Country Gentleman", was an American musician, occasional vocalist, songwriter, and record producer, who along with Owen Bradley and Bob Ferguson, among others, created the country music style that came to be known as the Nashville sound, which expanded country music's appeal to adult pop music fans. He was primarily known as a guitarist. He also played the mandolin, fiddle, banjo, and ukulele. Atkins's signature picking style was inspired by Merle Travis. Other major guitar influences were Django Reinhardt, George Barnes, Les Paul, and, later, Jerry Reed. His distinctive picking style and musicianship brought him admirers inside and outside the country scene, both in the United States and abroad. Atkins spent most of his career at RCA Victor and produced records for the Browns, Hank Snow, Porter Wagoner, Norma Jean, Dolly Parton, Dottie West, Perry Como, Floyd Cramer, Elvis Presley, the Everly Brothers, Eddy Arnold, Don Gibson, Jim Reeves, Jerry Reed, Skeeter Davis, Waylon Jennings, and many others. Rolling Stone credited Atkins with inventing the "popwise 'Nashville sound' that rescued country music from a commercial slump," and ranked him number 21 on their list of "The 100 Greatest Guitarists Of All Time." Among many other honors, Atkins received 14 Grammy Awards and the Grammy Lifetime Achievement Award. He also received nine Country Music Association awards for Instrumentalist of the Year. He was inducted into the Rock & Roll Hall of Fame, the Country Music Hall of Fame and Museum, and the Musicians Hall of Fame and Museum. Atkins was born on June 20, 1924, in Luttrell, Tennessee, near Clinch Mountain. His parents divorced when he was six years old, after which he was raised by his mother. He was the youngest of three boys and a girl. He started out on the ukulele, later moving on to the fiddle, but made a swap with his brother, Lowell, when he was nine: an old pistol and some chores for a guitar. He stated in his 1974 autobiography, "We were so poor and everybody around us was so poor that it was the forties before anyone even knew there had been a depression." Forced to relocate to Fortson, Georgia, outside of Columbus, to live with his father because of a critical asthma condition, Atkins was a sensitive youth who made music his obsession. Because of his illness, he was forced to sleep in a straight-back chair to breathe comfortably. On those nights, he played his guitar until he fell asleep holding it, a habit which lasted his whole life. While living in Fortson, he attended the historic Mountain Hill School. He returned in the 1990s to play a series of charity concerts to save the school from demolition. Stories have been told about the very young Chet, who, when a friend or relative would come to visit and play guitar, would crowd in and put his ear so close to the instrument that it became difficult for the visitor to play. Atkins became an accomplished guitarist while he was in high school. He used the restroom in the school to practice, because it had good acoustics. His first guitar had a nail for a nut and was so bowed that only the first few frets could be used. He later purchased a semi-acoustic electric guitar and amp, but he had to travel many miles to find an electrical outlet, since his home didn't have electricity. Later in life, he lightheartedly gave himself (along with John Knowles, Marcel Dadi, Tommy Emmanuel, Steve Wariner, and Jerry Reed) the honorary degree CGP ("Certified Guitar Player"). In 2011, his daughter Merle Atkins Russell bestowed the CGP degree on his longtime sideman Paul Yandell. She then declared no more CGPs would be allowed by the Atkins estate. His half-brother, Jim, was a successful guitarist who worked with the Les Paul Trio in New York. Atkins did not have a strong style of his own until 1939, when (while still living in Georgia) he heard Merle Travis picking over WLW radio. This early influence dramatically shaped his unique playing style. Whereas Travis's right hand used his index finger for the melody and thumb for bass notes, Atkins expanded his right-hand style to include picking with his first three fingers, with the thumb on bass. Chet Atkins was a ham radio general class licensee. Formerly using the call sign WA4CZD, he obtained the vanity call sign W4CGP in 1998 to include the CGP designation. [further explanation needed] He was a member of the American Radio Relay League. After dropping out of high school in 1942, Atkins landed a job at WNOX-AM radio in Knoxville, where he played fiddle and guitar with the singer Bill Carlisle and the comic Archie Campbell and became a member of the station's Dixieland Swingsters, a small swing instrumental combo. After three years, he moved to WLW-AM in Cincinnati, Ohio, where Merle Travis had formerly worked. After six months, he moved to Raleigh and worked with Johnnie and Jack before heading for Richmond, Virginia, where he performed with Sunshine Sue Workman. Atkins's shy personality worked against him, as did the fact that his sophisticated style led many to doubt he was truly "country". He was fired often, but was soon able to land another job at another radio station on account of his unique playing ability. Atkins and Jethro Burns (of Homer and Jethro) married twin sisters, Leona and Lois Johnson, who sang as Laverne and Fern Johnson, the Johnson Sisters. Leona Atkins outlived her husband by eight years, dying in 2009 at the age of 85. Travelling to Chicago, Atkins auditioned for Red Foley, who was leaving his star position on WLS-AM's National Barn Dance to join the Grand Ole Opry. Atkins made his first appearance at the Opry in 1946 as a member of Foley's band. He also recorded a single for Nashville-based Bullet Records that year. That single, "Guitar Blues", was fairly progressive, including a clarinet solo by the Nashville dance band musician Dutch McMillan, with Owen Bradley on piano. He had a solo spot on the Opry, but when that was cut, Atkins moved on to KWTO in Springfield, Missouri. Despite the support of executive Si Siman, however, he soon was fired for not sounding "country enough". While working with a Western band in Denver, Colorado, Atkins came to the attention of RCA Victor. Siman had been encouraging Steve Sholes to sign Atkins, as his style (with the success of Merle Travis as a hit recording artist) was suddenly in vogue. Sholes, A&R director of country music at RCA, tracked Atkins down in Denver. He made his first RCA Victor recordings in Chicago in 1947, but they did not sell. He did some studio work for RCA that year, but had relocated to Knoxville again where he worked with Homer and Jethro on WNOX's new Saturday night radio show The Tennessee Barn Dance and the popular Midday Merry Go Round. In 1949, he left WNOX to join June Carter with Mother Maybelle and the Carter Sisters on KWTO. This incarnation of the old Carter Family featured Maybelle Carter and daughters June, Helen, and Anita. Their work soon attracted attention from the Grand Ole Opry. The group relocated to Nashville in the mid-1950s. Atkins began working on recording sessions and performing on WSM-AM and the Opry. Atkins became a member of the Opry in the 1950s. While he had not yet had a hit record for RCA Victor, his stature was growing. He began assisting Sholes as a session leader when the New York–based producer needed help organizing Nashville sessions for RCA Victor artists. Atkins's first hit single was "Mr. Sandman", followed by "Silver Bell", which he recorded as a duet with Hank Snow. His albums also became more popular. He was featured on ABC-TV's The Eddy Arnold Show in the summer of 1956 and on Country Music Jubilee in 1957 and 1958 (by then renamed Jubilee USA). In addition to recording, Atkins was a design consultant for Gretsch, which manufactured a popular Chet Atkins line of electric guitars from 1955–1980. He became manager of RCA Victor's Nashville studios, eventually inspiring and seeing the completion of the legendary RCA Studio B, the first studio built specifically for the purpose of recording on the now-famous Music Row. Also later on, Chet and Owen Bradley would become instrumental in the creation of studio B’s adjacent building RCA Studio A as well. When Sholes took over pop production in 1957—a result of his success with Elvis Presley—he put Atkins in charge of RCA Victor's Nashville division. With country music record sales declining as rock and roll became more popular, Atkins and Bob Ferguson took their cue from Owen Bradley and eliminated fiddles and steel guitar as a means of making country singers appeal to pop fans. This became known as the Nashville sound, which Atkins said was a label created by the media for a style of recording during that period intended to keep country (and their jobs) viable. Atkins used the Jordanaires and a rhythm section on hits such as Jim Reeves's "Four Walls" and "He'll Have to Go" and Don Gibson's "Oh Lonesome Me" and "Blue Blue Day". The once-rare phenomenon of having a country hit cross over to pop success became more common. He and Bradley had essentially put the producer in the driver's seat, guiding an artist's choice of material and the musical background. Atkins made his own records, which usually visited pop standards and jazz, in a sophisticated home studio, often recording the rhythm tracks at RCA and adding his solo parts at home, refining the tracks until the results satisfied him. Guitarists of all styles came to admire various Atkins albums for their unique musical ideas and in some cases experimental electronic ideas. In this period, he became known internationally as "Mister Guitar", inspiring an album, Mister Guitar, engineered by both Bob Ferris and Bill Porter, Ferris's replacement. At the end of March 1959, Porter took over as chief engineer at RCA's Nashville studio, in the space eventually known as Studio B after the facility expanded with a second studio in 1960. (At the time, RCA's sole Nashville studio had no letter designation.) Porter soon helped Atkins get a better reverberation sound from the studio's German effects device, an EMT plate reverb. With his golden ear, Porter found the studio's acoustics to be problematic, and he devised a set of acoustic baffles to hang from the ceiling, then selected positions for microphones based on resonant room modes. The sound of the recordings improved significantly, and the studio achieved a string of successes. The Nashville sound became more dynamic. In later years, when Bradley asked how he achieved his sound, Atkins told him "it was Porter." Porter described Atkins as respectful of musicians when recording—if someone was out of tune, he would not single that person out by name. Instead, he would say something like, "we got a little tuning problem ... Everybody check and see what's going on." If that did not work, Atkins would instruct Porter to turn the offending player down in the mix. When Porter left RCA in late-1964, Atkins said, "the sound was never the same, never as great." Atkins's trademark "Atkins style" of playing uses the thumb and first two or sometimes three fingers of the right hand. He developed this style from listening to Merle Travis, occasionally on a primitive radio. He was sure no one could play that articulately with just the thumb and index finger (which was exactly how Travis played), and he assumed it required the thumb and two fingers—and that was the style he pioneered and mastered. He enjoyed jamming with fellow studio musicians, and they were asked to perform at the Newport Jazz Festival in 1960. That performance was cancelled because of rioting, but a live recording of the group (After the Riot at Newport) was released. Atkins performed by invitation at the White House for every U.S. President from John F. Kennedy through to George H. W. Bush. Atkins was a member of the Million Dollar Band during the 1980s. He is also well known for his song "Yankee Doodle Dixie", in which he played "Yankee Doodle" and "Dixie" simultaneously, on the same guitar. Before his mentor Sholes died in 1968, Atkins had become vice president of RCA's country division. In 1987, he told Nine-O-One Network magazine that he was "ashamed" of his promotion: "I wanted to be known as a guitarist and I know, too, that they give you titles like that in lieu of money. So beware when they want to make you vice president." He had brought Waylon Jennings, Willie Nelson, Connie Smith, Bobby Bare, Dolly Parton, Jerry Reed, and John Hartford to the label in the 1960s and inspired and helped countless others. He took a considerable risk during the mid-1960s, when the civil rights movement sparked violence throughout the South, by signing country music's first African-American singer, Charley Pride, who sang rawer country than the smoother music Atkins had pioneered. Atkins's biggest hit single came in 1965, with "Yakety Axe", an adaptation of "Yakety Sax", by his friend, the saxophonist Boots Randolph. He rarely performed in those days and eventually hired other RCA producers, such as Bob Ferguson and Felton Jarvis, to lessen his workload. In the 1970s, Atkins became increasingly stressed by his executive duties. He produced fewer records, but could still turn out hits such as Perry Como's 1973 pop hit "And I Love You So". He recorded extensively with close friend and fellow picker Jerry Reed, who had become a hit artist in his own right. A 1973 diagnosis of colon cancer, however, led Atkins to redefine his role at RCA, to allow others to handle administration while he went back to his first love, the guitar, often recording with Reed or even Jethro Burns from Homer and Jethro (his brother-in-law) after Homer died in 1971. By the late-1970s, RCA decided to remove Atkins from his production duties and replace him with younger men. He also felt stifled because the record company would not let him branch into jazz. His mid-1970s collaborations with one of his influences, Les Paul, Chester & Lester and Guitar Monsters, had already reflected that interest; Chester & Lester was one of the best-selling recordings of Atkins's career. At the same time, he grew dissatisfied with the direction Gretsch (no longer family-owned) was going and withdrew his authorization for them to use his name and began designing guitars with Gibson. Atkins ended his 35-year association with RCA in 1982 and signed with Columbia Records, for whom he produced a debut album in 1983. Jazz had always been a strong love of his, and often in his career he was criticized by "pure" country musicians for his jazz influences. He also said on many occasions that he did not like being called a "country guitarist," insisting that he was "a guitarist, period." Although he played by ear and was a masterful improviser, he was able to read music and even performed some classical guitar pieces. When Roger C. Field, a friend, suggested to him in 1991 that he record and perform with a female singer, he did so with Suzy Bogguss. He returned to his country roots for albums he recorded with Mark Knopfler and Jerry Reed. Knopfler had long mentioned Atkins as one of his earliest influences. Atkins also collaborated with Australian guitar legend Tommy Emmanuel. On being asked to name the ten most influential guitarists of the twentieth century, he named Django Reinhardt to the first position, and also placed himself on the list. In later years, he even went back to radio, appearing on Garrison Keillor's Prairie Home Companion radio program, on American Public Media radio, even picking up a fiddle from time to time, and performing songs such as Bob Wills's "Corrina, Corrina" and Willie Nelson's "Seven Spanish Angels" with Nelson on a 1985 broadcast of the show at the Bridges Auditorium on the campus of Pomona College (then Claremont College). Atkins received numerous awards, including 14 Grammy awards and nine Country Music Association awards for Instrumentalist of the Year. In 1993, he was honored with the Grammy Lifetime Achievement Award. Billboard magazine awarded him its Century Award, its "highest honor for distinguished creative achievement," in December 1997. Atkins is notable for his broad influence. His love for numerous styles of music can be traced from his early recording of the stride pianist James P. Johnson's "Johnson Rag", all the way to the rock stylings of Eric Johnson, an invited guest on Atkins's recording sessions, who, when Atkins attempted to copy his influential rocker "Cliffs of Dover", led to Atkins's creation of a unique arrangement of "Londonderry Air (Danny Boy)". Atkins's recordings of "Malagueña" inspired a new generation of flamenco guitarists; the classical guitar selections included on almost all his albums were, for many American artists working in the field today, the first classical guitar they ever heard. He recorded smooth jazz guitar still played on American airwaves today. Atkins continued performing in the 1990s, but his health declined after he was diagnosed again with colon cancer in 1996. He died on June 30, 2001, at his home in Nashville, Tennessee, at the age of 77. His memorial service was held at Ryman Auditorium in Nashville. He was buried at Harpeth Hills Memory Gardens in Nashville. A stretch of Interstate 185 in southwest Georgia (between LaGrange and Columbus) is named "Chet Atkins Parkway". This stretch of interstate runs through Fortson, where Atkins spent much of his childhood. In 2002, Atkins was posthumously inducted into the Rock and Roll Hall of Fame. His award was presented by Marty Stuart and Brian Setzer and accepted by Atkins's grandson, Jonathan Russell. The following year, Atkins ranked number 28 in Country Music Television's "40 Greatest Men of Country Music". At the age of 13, the future jazz guitarist Earl Klugh was captivated watching Atkins's guitar playing on The Perry Como Show. Similarly, he was a big influence on Doyle Dykes. Atkins also inspired Drexl Jonez and Tommy Emmanuel. Clint Black's album Nothin' but the Taillights includes the song "Ode to Chet", which includes the lyrics "'Cause I can win her over like Romeo did Juliet, if I can only show her I can almost pick that legato lick like Chet" and "It'll take more than Mel Bay 1, 2, & 3 if I'm ever gonna play like CGP." Atkins played guitar on the track. At the end of the song, Black and Atkins had a brief conversation. Chet's song "Jam Man" is currently used in commercials for Esurance. The opening guitar licks to the Miranda Lambert song "Only Prettier" sound very similar to Atkins's guitar-picking style. In 1967, a tribute song, "Chet's Tune", was produced for his birthday, with contributions by a long list of RCA Victor artists, including Eddy Arnold, Connie Smith, Jerry Reed, Willie Nelson, Hank Snow, and others. The song was written by the Nashville songwriter Cy Coben, a friend of Atkins's. The single reached number 38 on the country charts. In 2009, Steve Wariner released an album titled My Tribute to Chet Atkins. One song from that record, "Producer's Medley", featured Wariner's recreation of several famous songs which Atkins both produced and performed. "Producer's Medley" won the Grammy for Best Country Instrumental Performance in 2010. In November 2011, Rolling Stone ranked Atkins number 21 on their list of the "100 Greatest Guitarists of All Time". 1972 Best Country Instrumental Performance – "Snowbird"
1976 Best Country Instrumental Performance – "The Entertainer"
1986 Best Country Instrumental Performance with Mark Knopfler – "Cosmic Square Dance"
1991 Best Country Instrumental Performance with Mark Knopfler – "So Soft, Your Goodbye"
1991 Best Country Vocal Collaboration with Mark Knopfler – "Poor Boy Blues"
1994 Best Country Instrumental Performance with Asleep at the Wheel, Eldon Shamblin, Johnny Gimble, Marty Stuart, Reuben "Lucky Oceans" Gosfield & Vince Gill – "Red Wing"
1995 Best Country Instrumental Performance – "Young Thing"
1997 Best Country Instrumental Performance – "Jam Man"
^ a b c Gilliland, John (1969). "Show 10 – Tennessee Firebird: American Country Music Before and After Elvis. [Part 2]" (audio). Pop Chronicles. University of North Texas Libraries. ^ a b "Chet Atkins". Rolling Stone. ^ a b "Country Music Television biography". Cmt.com. Retrieved March 28, 2008. ^ a b c d e f g Atkins, Chet; Neely, Bill (1974). "Country Gentleman". Chicago. Harry Regnery. ISBN 0-8092-9051-0. ^ Rush, Dianne Samms (October 23, 1994). "Chet Plays; Gatlin Lives". Lakeland Ledger. Lakeland, Florida. p. 9C. Retrieved July 6, 2012. ^ Atkins, Chet; Neely, Bill (1974). "Country Gentleman". Chicago. Harry Regnery. p. 52. ISBN 0-8092-9051-0. ^ Halberstam, David (1961). liner notes. Chet Atkins' Workshop. RCA Victor LSP-2232. ^ a b c d e f g h i Atkins, Chet; Cochran, Russ (2003). "Me and My Guitars". Milwaukee: Hal Leonard. ISBN 0-634-05565-8. ^ Atkins, Chet; Neely, Bill. (1974). "Country Gentleman". Chicago. Harry Regnery. pp. 61–62. ISBN 0-8092-9051-0. ^ Freeman, Jon (November 22, 2011). "A Guitarist Paul Yandell Passes". Music Row. Retrieved July 6, 2012. ^ "Chet Atkins' Widow Dies". Country Standard Time. October 22, 2009. Retrieved October 29, 2011. ^ a b c "Chet Atkins Dies" Rolling Stone. Accessed on March 28, 2008. ^ "Opry Timeline – 1950s". Retrieved July 2, 2012. ^ Ballou, Glen (1998). Handbook for Sound Engineers. Focal Press. p. 1154. ^ a b c McClellan, John; Bratic, Deyan (2004). Chet Atkins in Three Dimensions. 2. Mel Bay Publications. pp. 149–152. ISBN 978-0-7866-5877-0. ^ a b "Chet Atkins", Rock and Roll Hall of Fame. Accessed on March 28, 2008. ^ Official Web Site of Chet Atkins. Accessed on August 27, 2014. 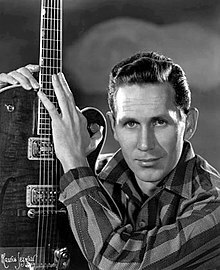 ^ "Biography – Chet Atkins". Rolling Stone. Accessed on May 10, 2008. ^ "Guitars Gently Weep as Nashville Pays Tribute to Chet Atkins". The New York Times. July 4, 2001. Retrieved September 19, 2016. ^ "Chet Atkins Parkway Bill Resolution". Archived from the original on January 28, 2005. Retrieved January 9, 2012. ^ "Performing Arts Center, Buffalo State University". Buffalostate.edu. Retrieved February 27, 2012. ^ Tommy Emmanuel official website biography. Retrieved September 2009. ^ Billboard, June 3, 1967, p. 41. ^ McClellan, John; Bratic, Deyan. Chet Atkins in Three Dimensions: 50 Years of Legendary Guitar, vol. 1. Pacific, MO: Mel Bay Publications. pp. 47–49. ^ Whitburn, Joel (2008). Hot Country Songs 1944 to 2008. Record Research. p. 392. ISBN 978-0-89820-177-2. Kienzle, Rich (1998). "Chet Atkins". The Encyclopedia of Country Music. Paul Kingsbury, ed. New York: Oxford University Press. pp. 26–27. Wikimedia Commons has media related to Chet Atkins. "Chet Atkins". Rock and Roll Hall of Fame.